Iron is essential for most living organisms. Despite its abundance in the Earth’s crust, iron is sparingly soluble under aerobic conditions, especially in calcareous and high pH soils, where iron is mainly precipitated as ferric hydroxides. Graminaceous plants, including important crops such as rice, wheat, barley, maize and sorghum, acquire iron from the soil by using natural iron chelators, the mugineic acid family phytosiderophores (MAs). 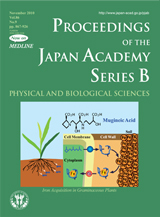 The MAs were discovered by Dr. Seiichi Takagi in 1970s, and their chemical structures and biosynthetic pathways were subsequently identified by Japanese researchers. Dr. Nishizawa, Dr. Nakanishi, Dr. Kobayashi and their colleagues clarified the biosynthetic pathway of MAs and isolated the genes encoding all the enzymes in this pathway. Subsequently, they identified other various genes involved in this mechanism. Iron translocation within plants at the molecular level has begun to be understood. Also, regulatory components of the genes involved in iron uptake and translocation are being identified. These findings have been applied to produce transgenic crops with enhanced tolerance to low iron availability in calcareous soils, or with a high seed iron content.